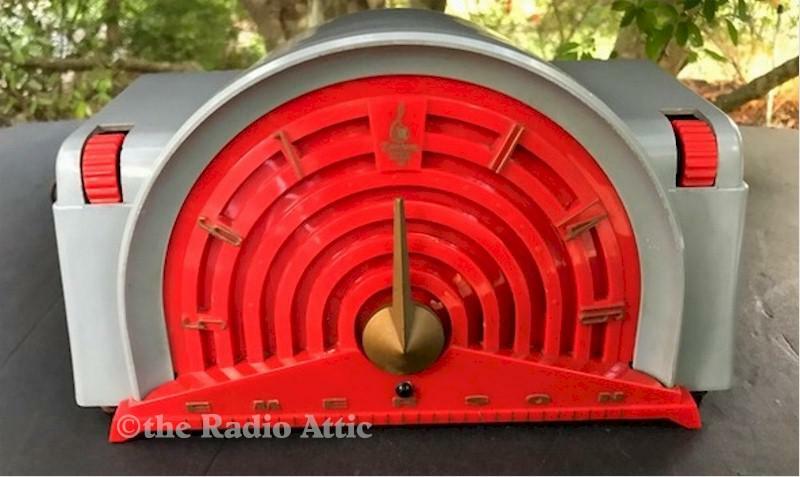 Here is a great collectible 1954 Retro Emerson radio in mid-century band shell design. Over 90% of these radios are sitting in collections with their feet broken off. Most people know that the "feet" are the small pieces on each end of the front bottom apron. Here is one in a striking red and gray color combination with its feet still in perfect condition. The case has no cracks, no chips, no cosmetic issues. The chassis has been recapped and checked by a professional, and the radio is playing clearly picking up all my local AM stations. The red indicator light is also working. There is a label on the bottom, and everything is completely original. I have put clear epoxy inside those little feet to give them extra strength to prevent any damage in the future. This is a radio that should have been sold with instructions to "Be Careful When Picking Up the Set." I don't believe you will find one in better condition. This radio will be safely packed. About 11"W x 6"H x 7"D.
You are visitor number 781 to this page.